The University of Wisconsin men's hockey team starts the Big Ten tournament against Ohio State. Tomkins saves a breakaway to keep it a 2-1 UW lead, 7:20 left/3rd. Tomkins stops UW's Cavallini on a breakaway with 7:25 left. 5:19 to go in the game and the Badgers still lead 2-1. They lead SOG 25-20. Berry makes a big right pad save on Schilkey alone in front of the net. OSU's Stork called for interference at other end. 4:58 left, 2-1 UW. A 2-on-1 for the Badgers leads to Ryan Wagner drawing an interference penalty against OSU. 4:58 shows on the clock. Kunin, running the top of the PP umbrella, hits the post behind Tomkins. Buckeyes kill the penalty. 2:48 left in the third with UW leading OSU 2-1. Buckeyes kill of the Badgers' power play. 2:58 to go with the Badgers up 2-1. UW 2, OSU 1. Buckeyes just killed a penalty. UW timeout with faceoff in its zone. 2:48 left/3rd. Ohio State calls a timeout with 2:48 left. Refs looking at a replay of a Healey hit on Kunin. Penalty coming, but we'll see how long. It might be a hit on UW's Greenway on the same sequence they're looking at. Both by Healey. And Healey is gone. Five-minute major with 2:28 left. OSU's Josh Healey has been given a five-minute major penalty and a game misconduct. Badgers will have a 5-minute power play with 2:28 left. Badgers have two defensemen out on the power play with Hughes' line. Badgers are killing a lot of time on this power play. Things that are odd to say. FINAL: Wisconsin advances to the Big Ten title game with a 2-1 victory over Ohio State. Will Johnson's third-period goal is the difference. Jack Berry makes 23 saves for the Bdagers, who get their 20th victory of the season. Just under eight minutes left in the second period. #Badgers outshooting BC 12-5 in the period. 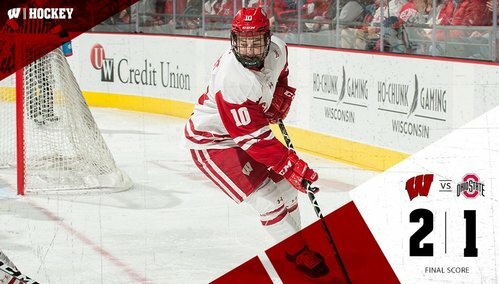 Thanks to a 3rd period goal from Will Johnson, the Badgers men's hockey squad advances to Big Ten Title Game tomorrow. Wisconsin will take on the winner of Minnesota-Penn State. Puck drops at 7 p.m. Confirmed that the major on Healey was for the hit along the boards on Kunin. FINAL: Wisconsin 2, Ohio State 1. Wisconsin moves on to the #B1GTourney championship. #Badgers head back out on the power play. 2:37 left in the second. BC kills the penalty. Under a minute left in the period. Third period is underway. Still scoreless here in St. Charles. A Badger player goes flying and UW heads on another power play. No dice for the #Badgers . UW now 0-4 on the power play tonight. Gardner is called for interference. UW looking to kill the penalty. #Badgers kill the penalty. 13:15 left in the period. Another great look, but Burt stops the Badger rush. One minute left in the third. WISCONSIN GOAL!!! Mellissa Channell gives the #Badgers the lead with just 16 seconds left in the period.